Cement companies or traders wanting to set up marine cement terminals have different options to realise a project. Terminals with relatively low throughput and expected short lifetime have to focus on small capital investments. Terminals with high throughput and long lifetime consider larger investments and focus on keeping operational and shipping costs at a minimum. As a matter of fact, the technical solution arises from an evaluation of the specific handling costs per ton of cement. Floating terminal: For a rapidly available,short-term utilisation of only a few months. Mobile mini terminal: For medium – to long- term use with small handling capacities that can be advantageous. Dome systems and Flat storage systems: For medium – to long- term concepts with high handling capacities in traditional silo plants. IBAU HAMBURG also delivers small terminals, which can handle about 100 to 250 thousand tons of cement per year. Custom-built terminals in steel construction offer the most advantages because of their flexible design possibilities, low need for civil works, short erection time as well as low investment costs. Depending on customer needs, the design comprises 2-8 steel silos, each with capacities of 1000 to 3500 t for storing different cement products. The silos are equipped with pneumatic discharge systems, which are adaptable for different diameters from 8-13 m and different capacities. The silos have a raised bottom for direct bulk loading into trucks or railcars with capacities of up to 350 t/h. The loading is either done by telescopic loading chutes or by IBAU Mobile loaders. JURONG PORT, SINGAPORE: New Terminal with several IBAU silos for Pan United and Raffles Cement (Holcim Group) among others. 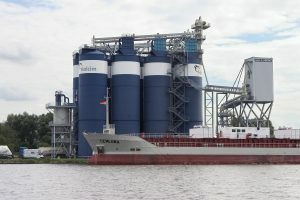 The silos are being fed by a belt conveyor system, which is fed by the IBAU Ship unloaders.